Last month we carried out our fourth annual Linux Graphics Survey in which we sought feedback from the Linux community about the most common graphics drivers and hardware in use, what display/GPU-related features desktop users are most interested in, and collect other metrics to aide developers. Here are the results from this year's survey. In regards to what technologies that the respondents are most interested in with regard to GPU-related features on Linux, improved 3D performance tops the list but is followed close behind with video acceleration. Further back in third is power management. In terms of video acceleration on Linux, if you are using a recent NVIDIA Quadro/GeForce graphics card with their proprietary driver you are all set with VDPAU as it's a great API, implemented very well within their driver for using the PureVideo HD engine, and can even allow HD video playback with very cheap hardware. VDPAU is supported by nearly all Linux multi-media applications and for those applications that do not yet implement the Video Decode & Presentation API for Unix, there is a VA-API front-end to handle the rest. NVIDIA's video acceleration for Linux is great with their proprietary driver, but for anything else, there's a lot left to be desired. Even with AMD and their Radeon graphics cards with the Unified Video Decoder 2, it is limited on the software side as AMD only exposes this UVD2 engine via their proprietary XvBA API. X-Video Bitstream Acceleration is not publicly documented and only exposed via a VA-API front-end, but there are bugs within the Catalyst Linux driver that often bar it from working right. However, at least AMD's proprietary driver attempts to offer some level of video acceleration. With open-source graphics drivers there really is not much besides Intel recently adding H.264 VA-API support to their driver when used with a new Arrandale / Clarkdale CPU. This should work fine for open-source Intel users assuming you have the very latest code, but if you have any slightly older Intel IGPs there is no video acceleration besides X-Video (Xv) and X-Video Motion Compensation (XvMC) that are both of limited benefit to the needs of today. Within the open-source Nouveau driver for NVIDIA hardware there have been attempts to do generic GPU video decoding in Gallium3D using shaders, but that has not gained much attraction or materialized much since its work in the summer of 2008. On the open-source ATI side right now, there is just the usual X-Video, but nothing yet viable for accelerating VDPAU or VA-API. While the proprietary AMD/NVIDIA drivers are rather fast today and run at the same speed or better than Windows and much faster than Mac OS X, the Mesa drivers are still slow and even Gallium3D is not yet at a performance parity to the proprietary ATI driver. Even with the Intel Linux 3D driver that is the total focus of Intel's open-source Linux team, the performance is horrific compared to the Intel Windows driver. Though do not expect the performance to improve by a lot in the near-term as the Mesa developers are still battling to even support OpenGL 3.0 and other core features that are likely to come before any optimization work. 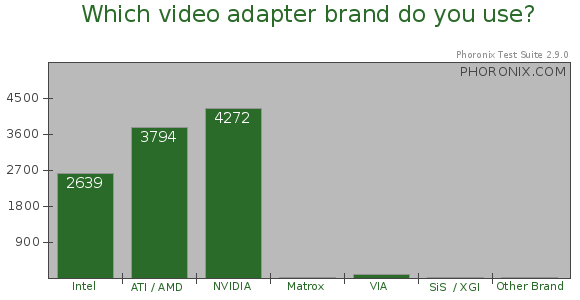 When it comes to what GPU brand is most popular on Linux, NVIDIA continues to command the market but compared to previous year's results, ATI/AMD continues to grow proportionally. With Intel's fully open-source driver stack and their IGPs being found in many systems, they also continue to have a significant market-share. A word from our partners: Looking for Microsoft Certification exams help? Join 70-667 training courses for all you need to pass for 642-971 exam.